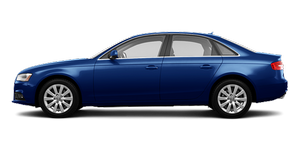 The interior of the Audi A4 models has also been refined. Audi offers a wide selection of new steering wheels with chrome and high-gloss inlays, with the leather sport steering wheel also featuring a flattened lower rim. The steering arm and the ignition key have been modified. High-gloss applications and the slender chrome trim at the controls add elegance to the interior. The high level of workmanship is as much a matter of course for Audi as a sure touch in the range of colors. All interior colors - except black - have been re-coordinated. The upholstery range has also been revised, with Fine Nappa leather replacing Valcona leather. The new, single-part cluster trim has been adapted in color to the interior, while the inlays are available in Aluminum Trigon, walnut dark brown and fine grain ash natural. Especially eye-catching is the Beaufort oak plywood inlay. The Audi A4 Sedan's luggage compartment still has its 480-liter capacity - 962 liters with the rear seats folded down (16.95 and 33.97 cubic ft). The A4 Avant and the A4 allroad quattro have 490 and 1,430 liters, respectively (17.30 and 50.50 cubic ft), with Audi offering an optional electrically operated tailgate for both models.